Greetings, everyone! Apologies for not posting for a long while! So far, October has been a fully packed month. Stay tuned for an update about our month…meanwhile, enjoy this post about El Nuevo Portal! 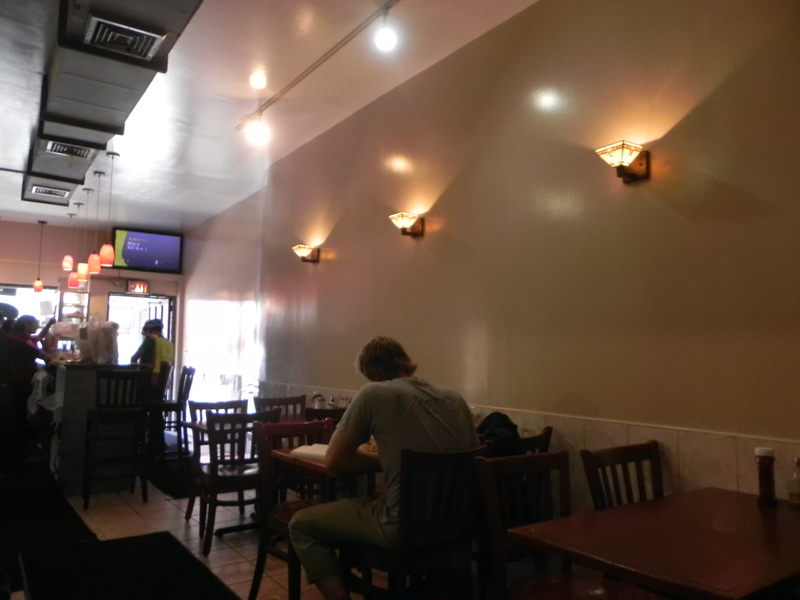 It’s not always that Victor and I explore around Brooklyn, but we wanted to check this small friendly restaurant called El Nuevo Portal. It was one of our stops while we were visiting some local thrift shops and small boutiques. 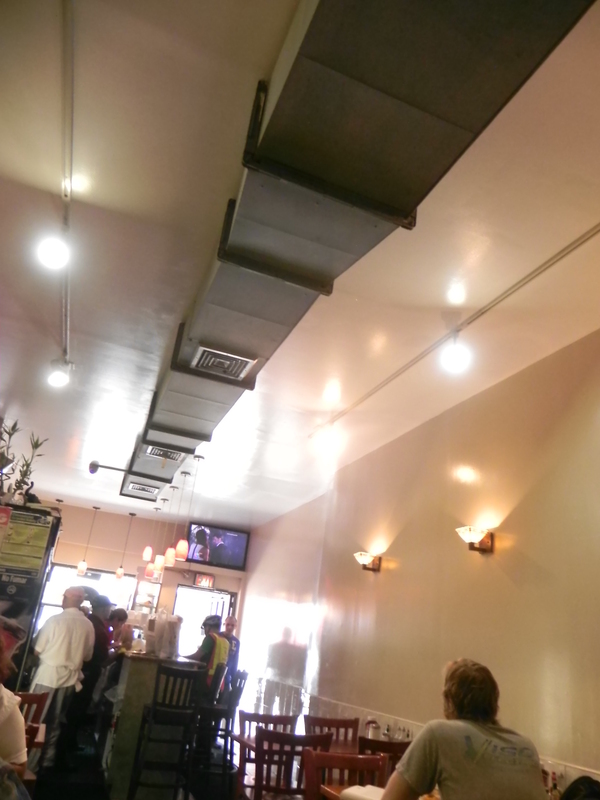 El Nuevo serves some authentic looking Latin food at an affordable price and served with smiles! You can see the interior design of this place, on Google Maps (Strange first experience for Victor and I). Nothing spectacular to speak about the design since this should be for a quick casual lunch and less fancy dinner option. Once you enter, you can simply take a seat if you see an open table. You do not have to order at the front, unless of course, you are ordering for take-out. They are pretty laid-back about everything here! Restroom was near the back, right next to the old jukebox of old music..The place was not sparkly clean, but decent enough! This restaurant is located in Cobble Hill, Brooklyn, and it’s a little over a mile walk from the Brooklyn Bridge. We don’t always go out to the most beautiful and lavishly decorated restaurants, but that’s okay. As long as the food is good, I’m all set! So, on our latest adventure, we stopped El Nueva Portal (which translates to “The New Portal”). It was definitely a portal of food to my stomach. Upon coming here, it may seem rather hectic, dependent on what time it is. We arrived just as lunch hour was coming to an end. We could still see people coming in and out, as we were seated and waiting for our food. 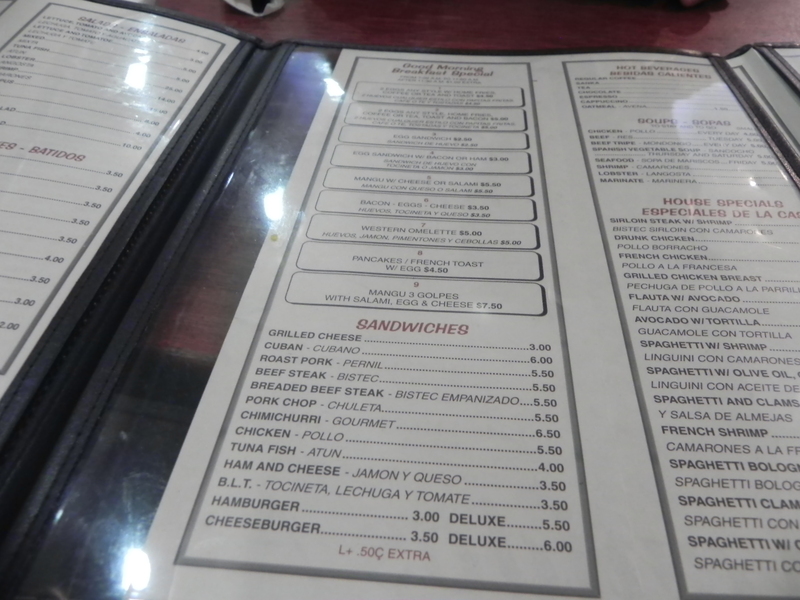 The menu has a large variety of food, ranging from sandwiches to tapas, rices dishes to stews. You should expect to have trouble selecting something when you come here. I ordered Breaded Steak Sandwich and Pinky ordered Rice with Chicken, along with a complimentary basket of warm and crispy bread. The breaded steak sandwich wasn’t dry at all and was very juicy. This sandwich is composed of a breaded piece of steak with lettuce and tomatoes sandwiched between crispy thin hero bread. For $4 dollars, it’s a tasty snack you grab on the go. 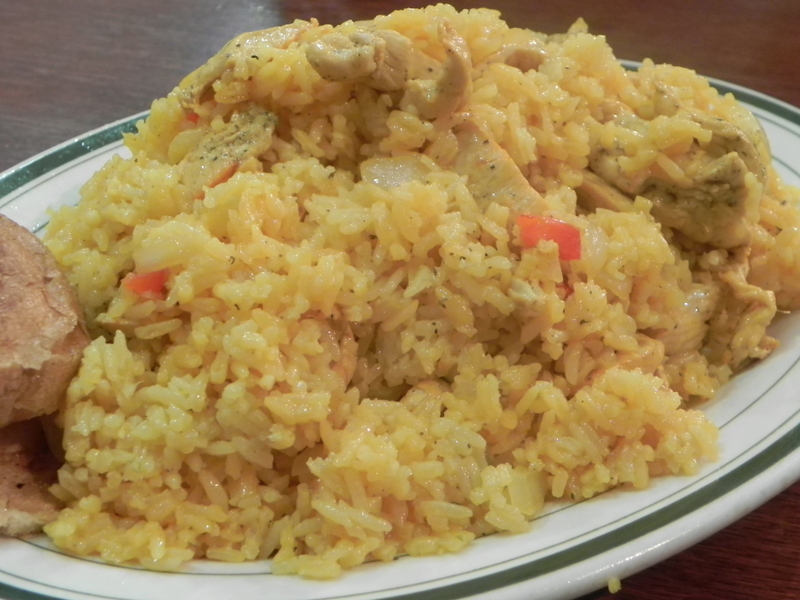 Pinky and I almost always get some sort of chicken and rice dish at any Spanish/ Latin American we go to. Different from the previous Latin restaurants we’ve been to, the chicken is actually mixed within the rice, whereas the previous restaurants put a piece of chicken on top. Regardless of how the chicken implemented into the dish, it still tasted excellent at El Neuvo Portal. They were very generous with their portions and this dish can easily feed two hungry people. The rice was very rich and buttery and there was actually a lot of chicken. This place can get very busy at times, but it’s worth coming if you’re on a budget and if you’re hungry, even if it isn’t the nicest looking place. This restaurant was delicious! First off, I would have to say that the staff were very hard-working. Although there were more customers than the staff could seem to handle during the lunch rush, they still pulled it off with a smile. Kudos to you, El Nuevo. Because of that, there were not enough free tables that were clean, but our waitress apologized before we even had any thought of complaining. I looked at the place and I wasn’t expecting fancy decor, but expected family-oriented atmosphere and completely received that vibe. The portions were huge and hot off the fire. The bread that the waitress gave us was fresh out of the oven it seemed, with lots of butter flavor. More importantly, it was not soggy, but crisp to the bite. Yummy! My Rice with Chicken arrived and was completely overwhelmed by the mountain I had on my plate. My first thought, “Oh I cannot finish this”, and it was a true statement… The chicken was tender and I loved the onions. I realized that it was listed on the menu as “Rice with Chicken” insinuating that there was definitely going to be more rice than chicken. However, I was still not disappointed! Hot and FRESH. I enjoyed the breaded beef steak! It was a nice new texture to explore on sandwiches. At the end of our meal, I took a portion of the rice and a small bite of the sandwich,home, so I could eat it the next day. Even still, the flavor kept and was equally nice to my taste buds. When Victor and I left, I was peering over to our neighbor’s meal at the next table. Dang, he ordered some kind of stew. It smelled so good and we could tell that he was a regular there. Next time, we shall try that! 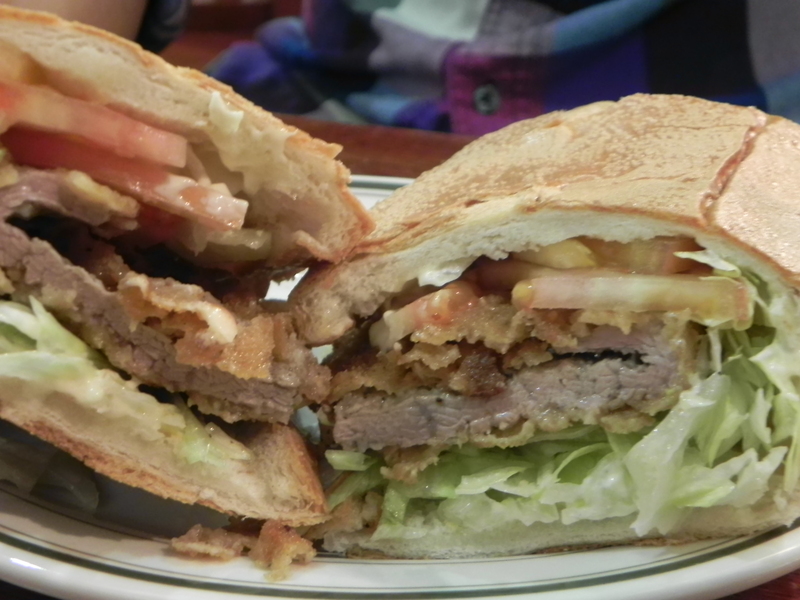 Posted on October 27, 2013 by pinkytwinkieeePosted in brooklyn, New YorkTagged affordable, beef, big portion, breaded beef steak, brooklyn, chicken, deals, delicious, dinner, easy, El Nueva Portal, El Nuevo, el nuevo portal, family, fast food, food, kind, latin food, lunch, onion, quick, restaurant, rice, sandwich, Smith Street Brooklyn, staff.